Two Puppy Mill Survivors Rescue 59 Dogs - Harley to the Rescue! Superheroes come in all shapes and sizes. 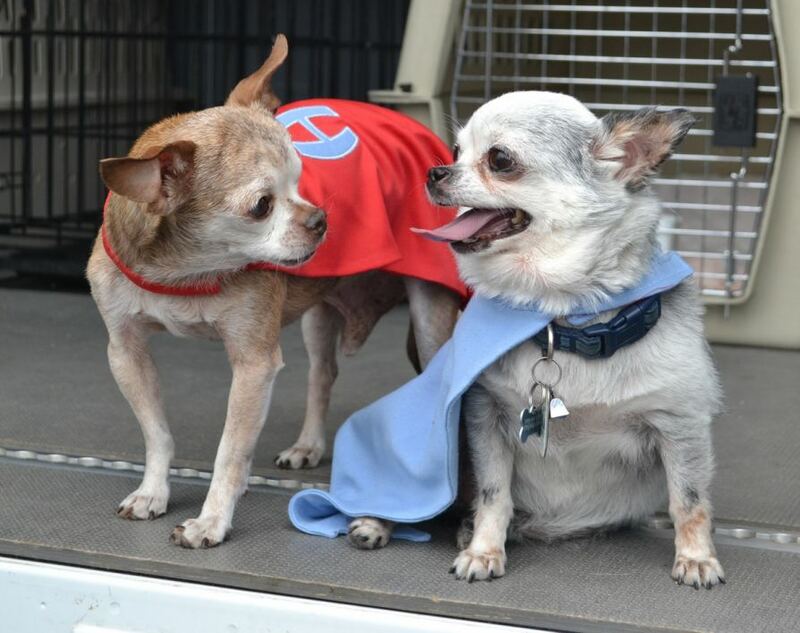 Two puppy mill survivors, Harley and Teddy, both Chihuahuas, donned their superhero capes and traveled through the Midwest this past weekend, saving 59 dogs from puppy mills with National Mill Dog Rescue. Teddy and Harley prepare to rescue dogs from puppy mills. COLORADO SPRINGS, Colo. - April 30, 2014 - PRLog -- The dogs rescued dogs were safely transported through Midwest storms to National Mill Dog Rescue’s facility near Colorado Springs, CO where they are currently receiving the care they need and will eventually find their forever homes. Harley, a 13 year old Chihuahua and an iconic figure in the world of puppy mill awareness through social media, spent 10 years as a commercial breeder in a puppy mill. His one-eyed, grizzled image is immediately recognizable, due primarily to the fact he lost an eye being power washed at the puppy mill. Although suffering with congestive heart failure, he actively uses his Facebook page with 45,000+ followers to spread awareness about the cruel realities of puppy mills and raise funds for non-profit rescue groups. Teddy, a newcomer to the social media world, lived his first 7 years in a puppy mill and was rescued from his cage a year ago. As Harley’s ‘Team Driver’, Teddy uses his page with 18,000+ followers to spread puppy mill awareness and share his experiences of learning about life outside the cage. .
‘Harley to the Rescue’ started out as a campaign to raise the $2,500 needed to fund one rescue of approximately 25-30 dogs. To date, these two dogs have raised over $150,000 and have rescued 324 dogs from the horrific conditions in puppy mills. Through their social media outlets, they chronicle their journey into the world of puppy mills, all from the perspective of puppy mill survivors. Dogs Saving Dogs! National Mill Dog Rescue is a Colorado Springs based 501(c)(3) organization that rescues, rehabilitates, and re-homes discarded commercial breeding dogs from puppy mills. NMDR relies on volunteers to care for the dogs, from the moment they are surrendered to the time they are adopted and beyond. The organization depends on the generosity of the public to provide the high level of care for our dogs and to continue to be able to save them. National Mill Dog Rescue started with a single sentence in an e-mail that Theresa Strader received: “50 Italian Greyhounds in need.” A large-scale breeding operation, or ‘puppy mill’ was going out of business and all 561 dogs were going to auction. One of those dogs was a seven-year-old Italian Greyhound named Lily. The moment their eyes met through the wire of Lily’s tiny cage, Theresa knew her life had changed forever and that this new life would include Lily and a mission to bring about lasting change. In honor of Lily, National Mill Dog Rescue was established in February 2007 to give a voice to mill dogs across the country. Since then, NMDR has rescued more than 8,700 puppy mill survivors, all while maintaining a strict no-kill policy. Every single dog that comes through the doors is spayed or neutered and given whatever additional medical care they need - without exception. They are groomed, many of them for the very first time. Years of filth and matted fur are removed, allowing the beautiful dog underneath to shine. Soon they learn about all the simple pleasures that they had never previously known – clean water, toys and treats, a soft bed, and most importantly, the love of a human companion.